Isuri PH meter is widely use for home and laboratory PH testing applications such as aquariums, swimming pools, household drinking water and etc. Highly accurate, covers the full measurement range of 0-14 PH range, masters a resolution of 0.01 pH, easy to read the result on screen. Easy to calibration, with the help of PH buffer powders and instruction, you can read and check PH levels very quickly. Pocket size PH meter, easy to carry with you to anywhere. Measuring the pH of drinking water or the water in your swimming pool is an important precaution to protect your health. Warnings: Isuri (TM) is the only legal owner and seller of the trademark Isuri (TM), we are not responsible for the fakes you bought from other tortious seller. Please be careful. If for any reason you are not happy with any product by Isuri (TM) please do not hesitate to contact us and we try our best to solve it once see your mails. Easy Use & Accurate: Just Turn it on, dip into the liquid and monitor the ph reading. The PH strips cover the 0-14 PH range, only takes a few seconds for your result to appear on screen. 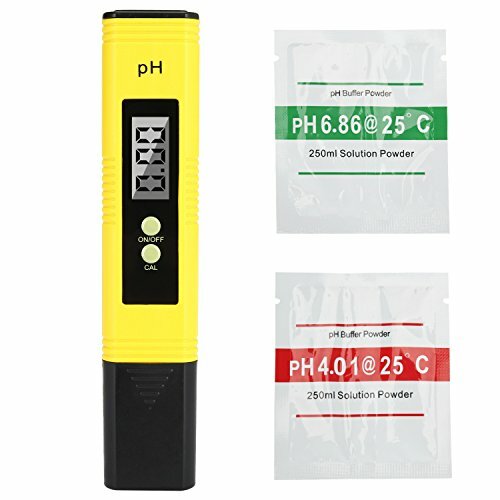 Auto Calibration Button: With 2-pack pH buffer powders, you can enjoy the complete frustration free mode to calibrate the digital pH Meter, even your kids can calibrate it to check PH levels instantly. Protable Size: Lightweight and pocket fitting PH meter, easy to carry with your bags or pocket. If you have any questions about this product by iSuri, contact us by completing and submitting the form below. If you are looking for a specif part number, please include it with your message.